This is the best sword ever! And my favorite sword in my collection with razor and I MEAN RAZOR sharp blades you can't ask for a better sword. Even Ninjas and Samurai are jealous. I would recommend you buying this sword because this is the highest quality sword you will ever buy it is perfectly balance I give five stars Thanks Budk . Well, there always has to be one, and I guess I'm it. I got my sword today, and not quite impressed as the rest of the reviewers. I ordered my sword on a Thursday and paid the overnight and didn't get my sword until the following Monday. So, the extra 24.99 I paid was a waste. Then when I opened the box...I swear its not the sword that was advertised and that I thought I had ordered. It's suppose to be razor sharp...well not this one, there is no trace of a hamon or even an attempt to sharpen the blade...second it supposed to polished, it looks like someone took some sandpaper to the blade, and considered that polishing. 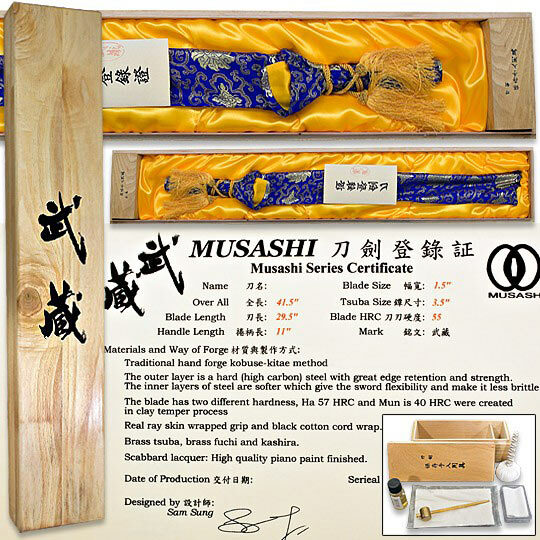 Overall craftsmanship was ok, but not great...not at all what I expected from a $350.00 sword. I guess the value most come from the box and maintenance kit. Disappointed, I'm glad the other reviewers had better experiences, however for me it did not meet my expectations and not worth the cost of the sword and overnight shipping. I will be taking my business elsewhere. One final note: the ITO was poorly wrapped and it looked like the materials from a used nike shoe string. Response: We are very sorry you were disappointed with your purchase. We do have a return policy and money back guarantee. Please contact our customer service department at 800-735-3326 for a refund or exchange. First of all, this is by far the most expensive piece I've bought here at True Swords. Is it worth it? Yes. I waited a while after I got the sword to let the novelty of getting the sword wear off and give it a fair and honest review. When I opened the package I was greeted with this oversized box wooden box. It was smooth and sturdy. Great for storage and display. I opened it and noticed one thing. The sword bag was black. Now, I was expecting it to be blue like the one in the picture but this one wasn't. Is that a bad thing? Not at all. I really enjoy the color on it and how it compares to the rest of the designs on the bag. If the color is a big thing for you then I would suggest contacting True Swords and making sure it's what you want. Next was the sword itself. When I opened the bag and retrieved the sword the first thing I noticed was how light it was compared to my other ones. I thought that maybe the scabbard was made of a lighter material. It's a scabbard, nothing special to it. Just like any other hardwood scabbard with a piano finish out there. When I pulled the blade out I was confused at what I saw. The blade was wrapped in plastic. It was the first time I've ever seen that but I'm glad it came that way. Once I pulled the plastic off I noticed that the blade was really oily (like REALLY OILY to protect it from rust during storage) and the wrap was preventing the inside of the scabbard from getting dirty. I liked that. One thing that's a problem is pulling the sword out and noticing more oil on the blade than when you put it in, this fixed that. The actual sword itself was really light. The Manganese is lighter than I expected, this is by far the lightest sword I own now (Which isn't a bad thing). Enough of the big things, lets get into the details of the sword. Lets start with the blade itself. Folded steel yields beautiful layers visible to the eye. The layers on this sword (Or at least mine) are very hard to see. It's most noticeable on the Kissaki (Point of blade) and even then you have to look close. This I believe is due to the fact that the blade is well polished, and I mean very well polished. Not something you see often in the $400 and under price range. It more noticeable on the Kissaki because it's less polished and it stands out a little bit more. This is getting kinda long so lets finish it up with one tiny detail that I didn't like. The guard itself. I like the design and the way it looks but mine seems to have had a little bit of trouble in the making. There seems to be a line across it where the metal seems to not have properly joined (At least on the surface). Barely noticeable since it's on the underside of it but it's still there. Also, the "Real ray skin wrapped grip" that is advertised isn't really "Wrapped". To me wrapped means fully going around the grip. This is not so for this sword (Or at least mine). Instead I got something common with a lot of swords and that's panels. 2 pieces of ray skin glued to each side. Again, this is not a big deal, many swords are done like this nowadays to cut back on costs. Just a small thing I thought needed to be brought out there. Overall this swords gets a 4.1/5. It's beautiful, it's light, it's sturdy. The fittings on it aren't the cheap ones that many people use. It's a great buy for the price and definitely worth it. Whether it's used for display or light cutting practices this definitely isn't a bad sword to have around. This sword is absolutly beautiful. I just got it a few hours ago and opened the case and saw absolute perfection. This is my first katana and I would just like to say Trueswords you guys are epic! This sword is definitely a good buy. the quality of the blade by itself is worth it, if all that was sold was the blade i still would have purchased it. but since it came with all the koshirae stuff i might as well review that. the number one thing that's going to annoy you is the tsuka. when the specs say that the tsuka is same wrapped, it doesn't mean 'wrapped' they mean something closer along the lines of 'paneled' because the only places that the same is located on the tsuka is the visible portion. this causes the ito to slide around and it's quite a hassle if you are going to do any tsuburi or tameshigiri with it. another thing about the quality of the tsuka is that the kashira came off because the tsuka ito wasn't tied correctly to it so i had to redo it. the fact that there's a cleaning kit that came with the sword is phenomenal. the wood box that came with the package is also very nice. the tusba and kashira and all the fittings are very aesthetically pleasing. there is only one word to describe this blade, Beautiful. The kissaki has a very defined yokote, and boshi. 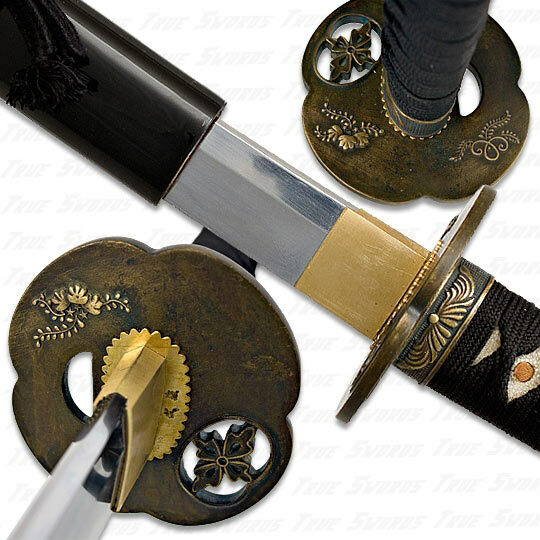 the hammon is beautful, and the tsuba is very well made. when you handle the blade it feels very substantial. for this price it can't get any better, anything more would cost you over 1300. if you have the money, and the skill, to obtain this blade i highly recommened it. the sword bag that was included was very good, however the cleaning kit was unremarkable. very well stocked, but the oil included is NOT Choji oil, i wont use it, but i will keep the bottle. Truly a magnificent value. And yes I realize I am saying that about a sword that costs $350. Â First impressions are that Musashi nailed the main details, are all very nice. The tsuba is thick, well made and very pleasing to the eye, I particularly enjoy the flower cutout and the raised and polished floral motifs, The fuchi and kashira are also very nice, the flower on the kashira is another elegant and well executed touch. the tsuka has a very tight wrap with a cord that feels like it's of a better quality than the cotton Ito on the 2 less expensive katana I ordered, The wrap has nice even diamonds. The ray skin same is a nice ivory color with fine evenly sized nodules. And all of the fittings are nice and tight. The saya is real wood but a fairly plain looking gloss black finish, it has a nice sageo (cord wrap) that uses a thicker and higher quality cord than the other swords I ordered. And the sword bag that it came with is really magnificent, it's just beautiful to look at. The wooden display box and sword maintenance kit are a couple more nice touches. 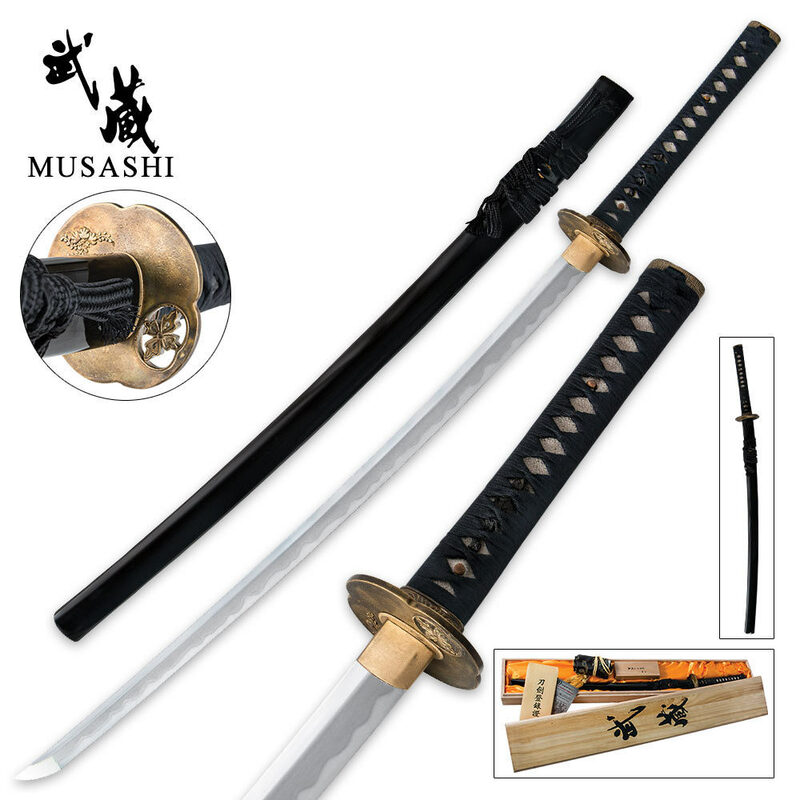 Â The blade is really the showpiece on this sword, it has been made in the traditional Kobuse folding and lamination process as detailed on the description page and to find that on a sword this price is amazing. It's a very nicely shaped blade with an attractive taper and curve, solid thick and heavy, with no bo-hi, (grooves) the folding process has produced a very subtle hada (grain pattern) that is most easily viewed along the activity line of the hamon. 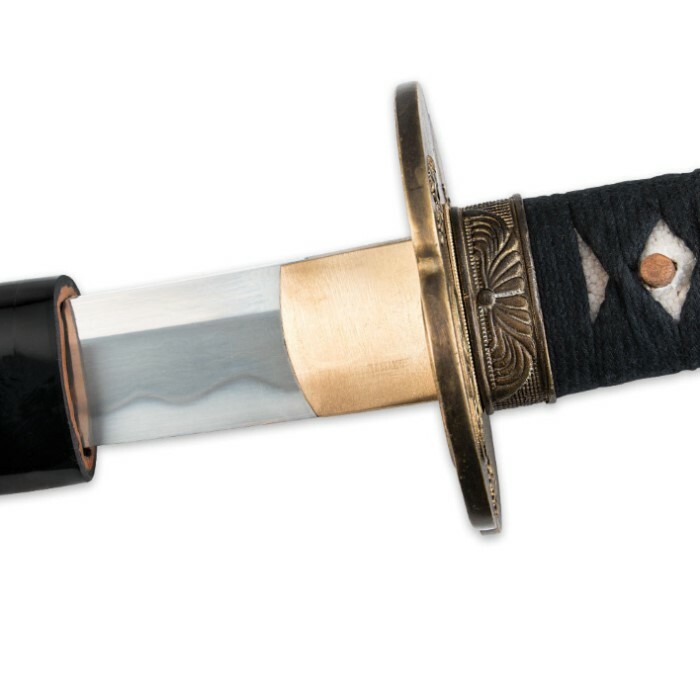 The hamon has a somewhat turbulent wave pattern and really stands out on the well polished blade, the kissaki or point is very well formed and has a clear yokote line, it also has a nice boshi. It is very straight and looking down the polish there is not a hint of waviness along the length of the blade. 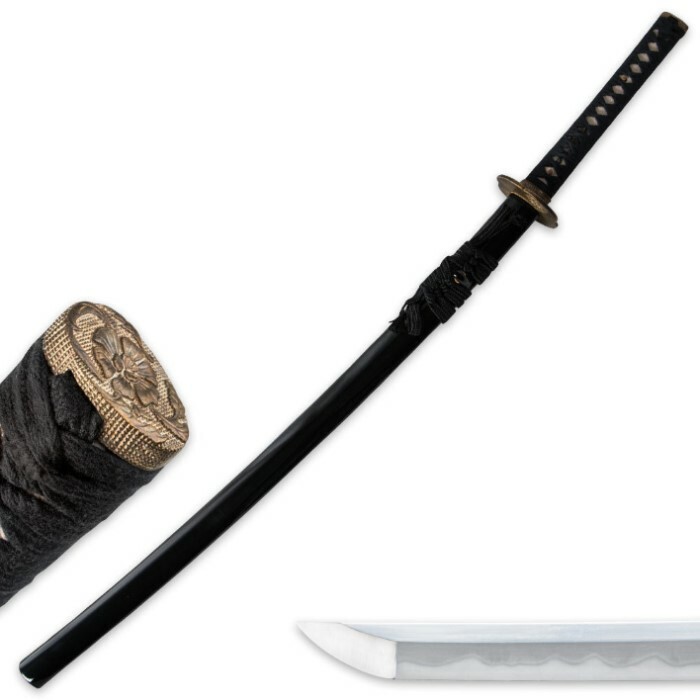 There are only 2 minor complaints I could make about this sword, the first is that the same wrap on the tsuka is not a full wrap, which makes it more likely that with heavy use the ito will shift around a bit, and the second is that seppa (spacers) are a notch below the rest of the fittings. And those are really minor issues on a sword this nice. I can enthusiastically say I give the Harmony a 5/5. Â I also have to say that I would rate Trueswords.com (http://Trueswords.com/)Â a 5/5 for the great customer service they have given me, the first sword I ordered came with some minor issues, they promptly cross shipped me another sword that came in great condition, and even sent me a return shipping label. Their shipping has been very prompt on all of the things I ordered and they have been very communicative in emails throughout the entire process. I thoroughly recommend that if you are looking to purchase a sword you look here first.